Your network contains an Active Directory forest that has a single domain. You have an Exchange Server 2010 organization. You plan to add a new domain to this Active Directory forest and deploy Exchange Server 2010 servers in the new domain. A user named Admin1 is a member of this Active Directory group named Organization Management. Admin1 will deploy the Exchange new domain. You need to identify the minimum permissions required to allow Admin1 to install Exchange Server 2010 servers in the new domain. Which group should you add Admin1 to? Your network contains an Active Directory forest. All domain controllers run Windows Server 2008. You need to ensure that you can install an Exchange Server 2010 server in the Active Directory forest. What should you do? A. From the Exchange Server 2010 installation media, run setup /ps. B. From the Exchange Server 2010 installation media, run setup /NewProvisionedServer. C. From the Windows Server 2008 installation media, run adprep.exe /forestprep. D. From the Windows Server 2008 installation media, run adprep.exe /domainprep. Your network contains a server named Server1 that runs Windows Server 2008 R2. Server1 has the following Remote Desktop Services (RDS) role services installed: Remote Desktop Session Host (RD Session Host)Remote Desktop Web Access (RD Web Access) You publish 10 RemoteApp programs on Server1 by using RD Web Access. You need to ensure that when users log on to the RD Web Access page, they see only the RemoteApp programs assigned to them. What should you modify from RemoteApp Manager? Your company has an Active Directory Rights Management Services (AD RMS) server. Users have Windows Vista computers. An Active Directory domain is configured at the Windows Server 2003 functional level. You need to configure AD RMS so that users are able to protect their documents. What should you do? A. Install the AD RMS client 2.0 on each client computer. B. Add the RMS service account to the local administrators group on the AD RMS server. C. Establish an e-mail account in Active Directory Domain Services (AD DS) for each RMS user. D. Upgrade the Active Directory domain to the functional level of Windows Server 2008. – The application must only be distributed to licensed users. – The amount of administrative effort required to manage the users must remain unaffected. – The three custom applications must be distributed to all existing and new users on the network. A. Create a new child domain for each department and link the AppInstall GPO to each child domain. Create a new GPO. Link the new GPO to the Sales domain. B. Create a new child OU for each department. Link the AppInstall GPO to the Marketing OU and the Engineering OU. Create a new GPO. Link the new GPO to the Sales OU. C. Create a new group for each department and filter the AppInstall GPO to each group. Create a new GPO. Link the new GPO to the domain. Filter the new GPO to the Sales group. D. Create a new group for each department. Filter the AppInstall GPO to the Marketing group and the Engineering group. Create a new GPO. Link the new GPO to the domain. Filter the new GPO to the Sales group. A. Deploy new servers with a Server Core installation of Windows Server 2008 R2. Migrate the shared resources to the new servers. B. Upgrade the existing servers to a Server Core installation of Windows Server 2008 R2, and then upgrade the servers to a full installation of Windows Server 2008 R2. C. Move the shared resources off of the existing servers. Perform a clean installation of Windows Server 2008 R2 on the servers. Move the shared resources back onto the servers. D. Deploy new servers with Windows Server 2008 R2 installed. Migrate the shared resources to the new servers. Your company uses Public folders and Web Distributed Authoring and Versioning. 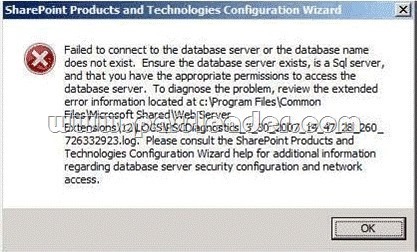 The company asks you to install Microsoft Windows SharePoint Services (WSS) as a server in a new server farm. You plan to install WSS on a server that runs Windows Server 2008 R2. You start the Configuration Wizard to begin the installation. You receive an error message as shown in the exhibit. You need to configure WSS to start SharePoint Services 3.0 SP 2 Central Administration. What should you do? A. Install the Windows Internal Database. B. Install a Microsoft SQL Server 2005 server. C. Install the Active Directory Rights Management Services role. D. Install the Active Directory Lightweight Directory Services role. Your corporate network has a member server named RAS1 that runs Windows Server 2008 R2. You configure RAS1 to use the Routing and Remote Access Services (RRAS). The company’s remote access policy allows members of the Domain Users group to dial in to RAS1. The company issues smart cards to all employees. You need to ensure that smart card users are able to connect to RAS1 by using a dial-up connection. What should you do? A. Install the Network Policy Server (NPS) server role on RAS1. B. Create a remote access policy that requires users to authenticate by using SPAP. C. Create a remote access policy that requires users to authenticate by using EAP-TLS. D. Create a remote access policy that requires users to authenticate by using MS-CHAP v2.